This is the essential Parker collection. Not only does this volume contain all the poetry she published in her previous books—Child of Myself, Pit Stop, Womanslaughter, and Movement in Black—it also has a rich supply of prose, plays and previously unpublished poems. We first became friends and poet-activist comrade-colleagues in 1970, and though she passed in 1989, she continues to be a vital part of my life. I was pleased recently to come upon “Mama and the Hogs,” an unpublished story of hers mixed in with my papers, and sent it on to editor Julie Enszer. Praises to Julie and Sinister Wisdom for producing this essential volume. The opening book party in San Francisco featured a sweet evening with sixteen readers interpreting Pat’s work. Words and phrases from Parker’s writing continue to reverberate for current times. Julie Enszer has also released a recent edition of Sinister Wisdom dedicated to honoring the great Michigan Womyn’s Music Festival. Readings to celebrate the issue were well-attended in Chicago, Grand Rapids, New York City and many other places. 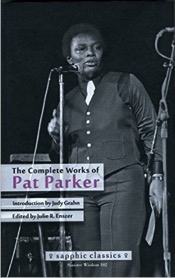 With Every Step I Take is the latest book offering from Pat Parker’s good friend Avotcja, poet, musician, performer and activist-organizer: ”I fight so hard because I LOVE/RESPECT this EARTH/Sacred Mother of us all”…. And Avotcja’s direct poetic voice fights equally for social justice for earth’s people. This is a rich, substantial volume with a glossary for everything from urban street slang to musical instruments to Yoruba and Mexican/South American deities, and more—testimony to the range of story and knowledge embedded in her poetry. And while I’m at it I want to mention two other authors: Amarananda Bhairavan, the South Indian-raised spiritual teacher whose two fine prose books are Kali’s Odiyya: A Shaman’s True Story of Initiation, and Medicine of Light: A Shaman’s Journey Through Mystic Space-Time. For a solid and authentic introduction to Goddess Kali, these books are the best, in my humble opinion. Beautiful, important poetry from Brynn Saito, Power Made Us Swoon (2016), and The Palace of Contemplating Departure (2013). Especially newsworthy because Brynn engages with her family’s experience of Japanese detention camps in the US, at this time when threats of using such camps against Muslims and Mexican immigrants have again surfaced. Both volumes are from Red Hen Press in Pasadena, the outfit that is enabling young poets to breathe new life into the grand old voice of poetry.